Once you decide that you would like to open up a franchise, you hear a lot of advice. Contrary to what a lot of franchises claim, starting any small business is a risk, and not everyone is successful at it. At ProSource®, we do everything that we can to support our franchise owners. We assist you along every step of the way, from negotiating your lead to merchandising your new showroom to recruiting staff members and training. Our franchise owners have proven to be incredibly successful under this model. That being said, we are only one half of the equation: the rest is up to you. 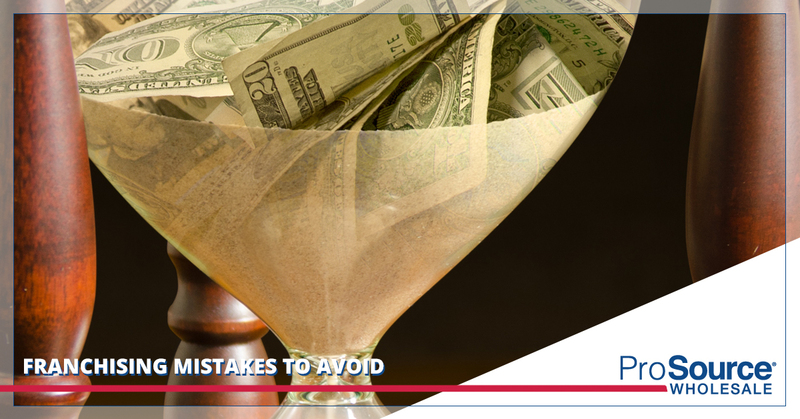 Therefore, if you are thinking about taking advantage of one of the best franchise opportunities out here, here are some mistakes you should avoid as you consider opening up a ProSource franchise. A common mistake that franchisees make is not following the system laid out before them. At ProSource, we afford you every opportunity for growth, but it is worthless if you don’t actually listen to us. All too often, franchisees feel that they are following the system when they are really only half-heartedly instituting our plan while cutting corners where they find necessary. Too often when this happens, they don’t see the growth they desire and wonder what went wrong. We are a franchise corporation because our business model has proven to be replicable, so if you want to share in our success, you must replicate it. When you follow the system to a T, you learn exactly why so many of our showroom owners find more success than they expected. It’s unsurprising that ProSource franchisees are ambitious people who are driven to work hard. These are incredible qualities, but like anything, there are disadvantages to embodying these characteristics. One of them is that it may be difficult for them to delegate. They are so capable and have such faith in being able to do anything, they often end up doing everything. As a business owner, it is more important to focus on what you are good at doing rather than what you’re capable of doing. For example, you might be able to stumble through PhotoShop because you are tech-savvy and intelligent. But if you hired a graphic designer instead, they could accomplish in five minutes what would take an hour of your time. Delegate what you can to reduce the amount of time you’re spending on unnecessary tasks. Many of our franchisees came to open a ProSource trade room because of their previous success with business. Many have already owned thriving small businesses, and wish to break into something a little different with our home improvement franchise. They assume that because they have business experience, they are guaranteed to thrive. Having experience does not necessarily translate into success with a ProSource franchise. While we love working with individuals who have faith in their abilities, it’s important to approach opening a franchise with humility and a growth mindset. Network with other franchisees, use the resources provided to you, and prepare to learn more than you previously thought you could. Some people open franchises under the impression that customers will just come to you. They essentially think of it as a business in a box, and when they set it up, they believe that it will all just fall together. Opening up a franchise is like opening any business: you will need time to market it and build up brand recognition before the customers are beating down your doors. While we provide a lot of support to our franchisees, this doesn’t mean that you won’t be putting time, energy, and effort into growing your business. The advantage of opening up a franchise is that you have access to a whole network of people who have been in the same place as you, so use it! When you have an entrepreneurial spirit, it’s natural to be independent and use to forging your own way, but you can save yourself a lot of trouble by having some humility and listening to what other franchise owners have to say. ProSource is one of the best franchise opportunities you can take advantage of, but only if you are willing to avoid these common mistakes. If you are willing to listen, learn, and approach your franchise the right way, you have every chance to thrive with your own ProSource showroom. If you are ready to take advantage of this opportunity, get started here today.